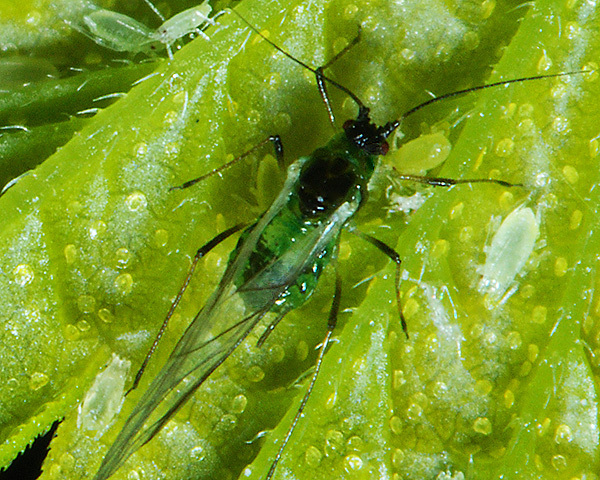 Phorodon are medium-sized aphids on their winter hosts (2.0 - 2.6mm long), but smaller on their summer hosts. 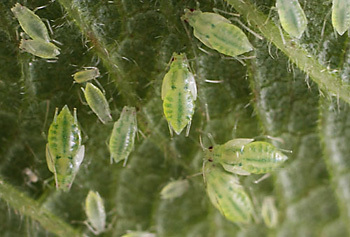 They are generally green, and adult viviparae may be winged or wingless. 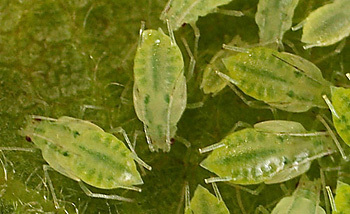 Phorodon aphids have characteristic projections on the inside of the antennal tubercles and on the inner side of antennal segment I. Their siphunculi are pale, medium length, thicker at their bases and slightly curved outwards at their tips. The cauda is short, pale and blunt. Winged forms have a black patch of fused cross bars on the upper surface of the abdomen. Phorodon is a small genus of only 4 species in Europe, north Africa, and south-west Asia, and has been introduced to North America and New Zealand. They have a sexual stage in the life cycle. Some alternate between the primary host of blackthorn and plum (Prunaceae) and the secondary host, hops (Cannabidaceae). Other Phorodon species feed only on the secondary hosts. They are not attended by ants. 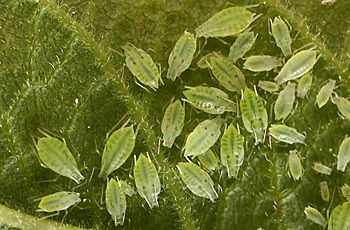 One species (Phorodon humuli) is the main pest on hops, causing damage directly and through virus transmission. The species below (all individuals less than 3mm) was on leaves of Wild Damson also at the Recreation Ground of Clifton, Beds. Though I have had what seems to be the same thing on the Victoria Plum in our garden. Would I be correct in thinking these are Phorodon humuli rather than Hyalopterus pruni, or are the images not good enough/ specimens too immature to be sure? I think am correctly seeing the elongate projections on the inside of the antennal tubercles (which I assume is not a feature of the Hyalopterus sp.) and there is no sign of any mealyness. [These] are indeed Phorodon humuli. 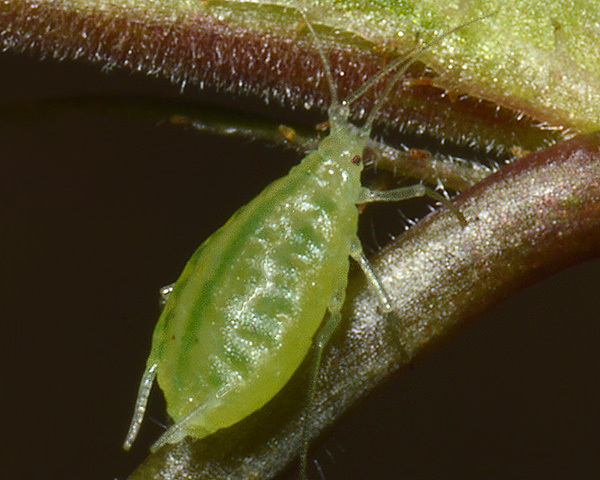 The pointed projections on the antennal tubercles are very distinctive.